Families participate in the “Carbon Cycle Game” to learn about differences between using fossil fuels and biofuels for transportation. The events were designed with families in mind. It was a treat to see children enjoying time outside while adults were engaged by presentations nearby. UW student volunteers from the NASA Space Grant Consortium lead youth in a hands-on fermentation experiment (left), while adults learn about renewable energy and Extension (right). Outreach specialists from the Washington NASA Space Grant Consortium and Snohomish County Extension 4H Program came with games and energy-related experiments for children and young adults. Meanwhile, the adults learned from AHB Extension and knowledgeable community members about where energy comes from, how planes can fly on biofuel, how poplars can be used for biofuels and bioproducts, and what services Extension has to offer. Everyone came together to play a carbon cycle game, where people representing oil refineries, biofuel sources, and transportation methods passed balloons to illustrate the difference between renewable and non-renewable energy. Yolimar Rivera Vasquez and Tatiana Giraldo facilitate the Carbon Cycle Game by handing off “plant-based carbon” (green balloons) to the “biofuel sources” (participants with green name tags) (left). Cat Gowan helped by holding “carbon” (black balloons) in the “atmosphere” (pop-up bin), where the carbon ended up after being emitted by an “airplane” (participant with yellow name tag) (right). 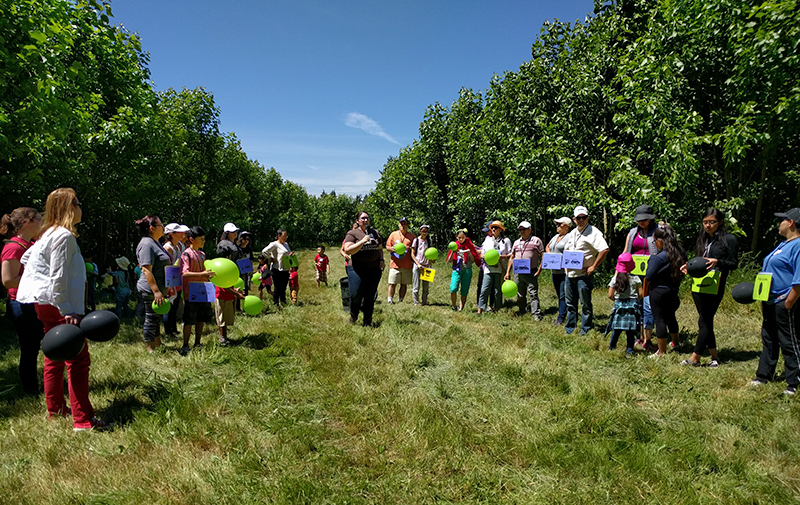 For the last part of the event, AHB Extension led everyone on a tour of the demonstration farm, teaching about how the trees are grown and harvested and how the farm is being used by researchers. 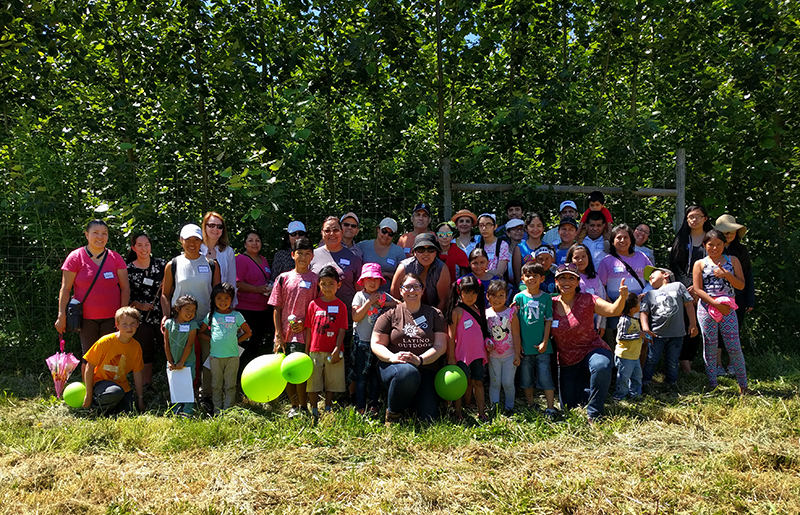 After touring the poplar farm, the group came together for a photo. The response to both of the field tours was overwhelmingly positive. Attendees appreciated the location and information. “It was truly a great educational experience to learn about this topic. It was not just a talk but a direct experience with the nature and benefits of it,” shared a participant on a post-event evaluation. The response to the field tours made the Extension Team excited to plan other Spanish-language events. One attendee requested more events like this one designed for kids AND adults, asking for ideas on how to work together on energy issues with their children. Consequently, the Extension Team is currently organizing a “Bioenergy Carnival” for November.